Can robots solve the aging problem in Japan’s work force? It’s getting hard for employers to find qualified workers in Japan, and a rapidly aging society is the reason for the worker shortage. In September 2017, 28 percent of the population was over 65 years old, according to the Ministry of Internal Affairs and Communications of Japan. The size of the working-age population declined 13 percent to 76.7 million from 86.6 million between 2000 and 2016, according to a research paper by Daiji Kawaguchi. The ratio of job openings to applicants is 1.59, up 11 percent compared with the same time last year. Instead of introducing immigration, Japan is trying to use robots to compensate for the labor shortage. According to data provided by NEC Fielding Ltd., a company that provides IT support service, the number of robots in Japan will reach 53,000 in 2025, and more than half of them will be used in service industries. Some underpopulated regions are trying to attract people and tourists to live and visit by using service robots. NEC deployed five Pepper robots, which stands for Personal Robot That Reads Emotions, to a region called Daigo-machi in Ibaraki Prefecture, which is suffering a population decrease, for tourism services. According to a presentation by Takashi Etou in the robotics promotion department in NEC, the robots were placed in hotels and tourist attractions to provide information and show hospitality. Using facial recognition, Pepper robots are able to provide a customized experience, starting by speaking the visitor’s name. But after that the robot can offer only general remarks such as listing local attractions. For more specific information the visitor still has to consult with human employees. Nishimura Keiko, a visiting research fellow at Sophia University, said in an interview via email that there’s a gap between the user experience of the service robots and their advertised. “Most of the commercials that Pepper stars in you’ll see a communication robot conversing with a human interlocutor with natural speed and rhythm. In reality, that is often not the case,” Keiko wrote. It’s expensive to squeeze technologies into a small robot that can perform advanced programmed tasks, for example, voice recognition and communication. User experience is likely to be affected when manufacturers have to draw a line between affordability and quality. Even when using networked servers to store processing data in the cloud, internet conditions may fail and the robots will not work. The environmental and technological limitations are challenging for service robots’ development. Travel agency H.I.S Co. is the first to use robot receptionists at the front desk. Henn na Hotel in the Ginza district is the company’s fifth hotel employing such robots, all manufactured by Kokoro Co. Ltd. 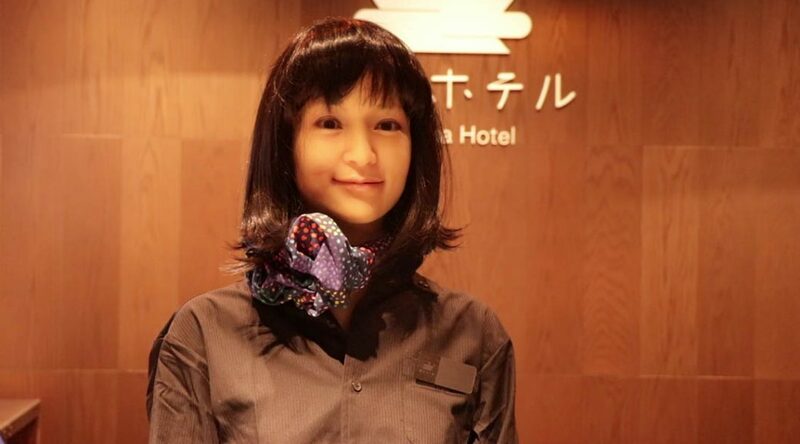 The robots have saved the hotel from hiring several employees, Yasuhiko Hoshi, associate director of Henn na Hotel in Ginza, said in an interview. There are only seven people managing this hotel, which has 98 rooms, compared with 15 people in other hotels of similar size, he said. “There will be less working people in Japan in the future, and people don’t like to work in hotels. So we need to create new type of hotel,” said Hoshi. However, the robots aren’t involved in the check-in process. The customers need to fill out a paper information form for a human at the front desk, and then go to a kiosk to make payment. Yuou Lu, a customer from China, felt disappointed and said he wouldn’t come back for the robots, after he discovered that they can only sit behind the desk, move their head and blink their eyes, and repeat the welcome introduction over and over again, instead of interacting with him. Nevertheless, Hoshi insisted, presenting a creative feature in the hotel is entertaining, and guests are persuaded to try the company’s other four hotels, which have robots in other, non-human forms, like dinosaurs. According to booking.com, the two-night rate in March for a twin room in Henn na Hotel in Ginza is $375 per night. Even though robots in Henn na Hotel can do very limited things, they are still considered robots, Keiko said, because “it moves its body and it has a sensor and a control function,” Keiko, the university researcher, said in an interview. The hotel’s goal is to replace humans’ work with technology, like artificial intelligence, though it’s still immature, Keiko went on. Consequently, the robots are considered as tourism attractions without material functions. Robot developers are aiming to give robots more functions and they’ve already found limited roles that can be expanded, she said. The service industry in Japan is growing rapidly. Among all the employed persons in Japan, employees in service jobs constituted more than 80 percent in 2017 compared with 78 percent 10 years ago. However, like other developed countries, labor costs are growing over the years, pushing development of service robots. In a cafeteria called Henn na Café, operated by H.I.S. in the Shibuya district, Tokyo, a robot named Sawyer is the only barista. The manager of the store, Taiki Sato, said that the robot, produced by Rethink Robotics, a U.S. company based in Boston, is a great saving for his business although it costs $60,000. The daily job would need two human workers, and the salary cost would be $2,000 per person a month. A German tourist, Monika Turnaus, who bought a mocha coffee from the cafeteria, said the experience is unique. Although she found the $4 cost a bit higher than the average coffee price in Tokyo, she said it didn’t seem too expensive because she has never been to a robotic cafeteria in Germany. The robot barista is attracting customers, Sato said. The average number of customers per week is 200, and is increasing. However, some people argue that the robot barista is not a promising business. 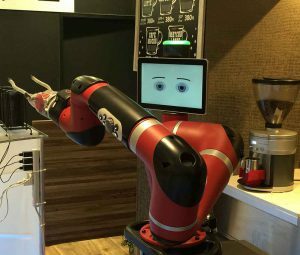 It’s just a simple version of robots in manufacturing, and it won’t be popular since it’s common to grind coffee beans and make fresh coffee in vending machines, said Hideki Mori, a tourist guide and a retired account manager in the Robotics Division of ABB Japan. “I don’t believe it’s necessary to have a robot barista. Having robots to set the cup and pour hot water is okay, but it will not last long,” said Mori.